Although the war in China had been raging since 1937, it wasn’t until 1939 that Europe likewise followed Asia into a general war. The two conflicts would remain largely separate endeavours until the Japanese attack on Pearl Harbor in 1941, but there were a number of occasions when the European war spilled over into the Pacific. The most obvious example of this is the deployment of German surface raiders into the Pacific and Indian Oceans to harass British shipping by capturing vessels as prizes or, failing that, sinking as many ships as possible. The German raider fleet consisted of several merchant vessels which were taken into Kriegsmarine service, called hilfskreuzer or auxiliary cruisers. These ships were completely reconfigured, being fitted with large numbers of medium-calibre guns in concealed mounts – often these weapons were hidden behind false plates in the hull, or disguised within fake cargo containers on the deck. They were also fitted with underwater torpedo tubes and carried stocks of mines to be sown in Allied shipping lanes. Other stores included materials such as paint and wood which could be used to alter the appearance of the ship by mimicking similar vessels in Allied or neutral service. Raiders were equipped with one or two reconnaissance seaplanes, usually He114s or Ar196s, to extend their ability to find merchant ships in the vast ocean wastes. They were usually assigned only one crew consisting of a pilot and observer, as well as a small ground crew for servicing the aircraft. On raiders with two floatplanes, one was usually kept in the hold as a spare in case the first machine became unserviceable due to damage or lack of spare parts. Replacement aircraft could sometimes be shipped out to raiders from supply ships that met up with them at safe points around the world. The first raider to reach the Pacific was the Orion, also known as “Schiff 16” to the Germans and codenamed “Raider A” by the British. She was captained by Kapitan zur See Kurt Weyher. The ship was fitted with six concealed 150mm guns, several smaller anti-aircraft guns, six torpedo tubes, over 200 mines and a single Arado Ar196 floatplane. Her unreliable oil-fired engines were 20 years old and had previously powered the liner New York and then been fitted to the Kurmark, which was renamed Orion on entering Kriegsmarine service. Orion had departed Germany on the 6th of April 1940, sailed north of Iceland to avoid British patrol lines, and had then made her way through the Denmark Strait. She then sailed south through the Atlantic disguised as a Soviet freighter before rounding Cape Horn and entering the Pacific on the 21st of May, changing to a Dutch disguise soon after. Arriving off Auckland on June 12th to begin operations against Australian and New Zealand traffic, Orion laid a minefield that quickly claimed the British liner RMS Niagara which sank along with her cargo of 600 gold bars. Almost a year later the minesweeper HMNZS Puriri also fell victim to one of Orion’s mines. 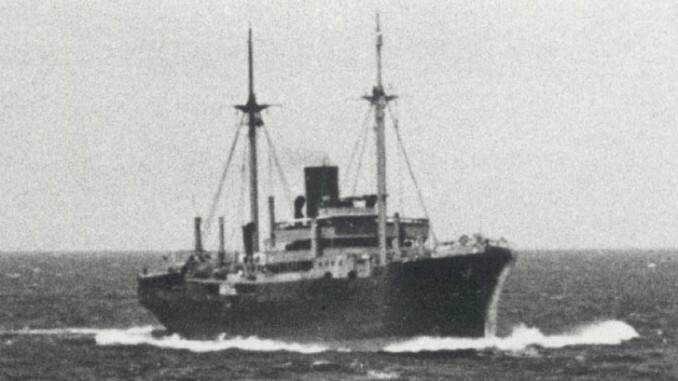 Later, Orion encountered the Norwegian registered Tropic Sea carrying a load of wheat to Britain, took her as a prize, and sent her back to Germany with a new name – Kurmark, to honour Orion’s former identity. The difficulty of operating seaplanes from civilian-type ships was demonstrated when Orion’s Arado seaplane was damaged during unloading, and then again when it capsized upon landing back at the ship. This left the aircraft out of action and unusable for scouting until the small support team could repair it. But repaired the Arado was, and on August 13th an attempt was made to use it to scout Noumea, the capital of Free French New Caledonia. The reconnaissance was successful but the Ar196 had to ditch due to fuel problems, and the Orion spent a day searching for her missing charge before finally bring it back aboard. The pilot, von Winterfeldt, reported seeing 4 ships in the harbour. Whilst waiting for these to emerge Orion sighted the collier Notou making her way to the island, and sank her. Ordered to make the trip home via Indian Ocean, Orion again set sail for Australian waters where on August 20th she attacked and sank the refrigerated freighter Turakina in the Tasman Sea. Two days later an Australian patrol bomber flew over the Orion but did not recognise her as an enemy vessel, leaving her free to continue – her disguise as a Dutch freighter proving good enough for her to pass unmolested. Several squadrons of Royal Australian Air Force (RAAF) flying boats and Hudson bombers were engaged in a usually fruitless search for the Orion as concern grew over the number of sunken and missing ships in the Tasman Sea credited to the raider. 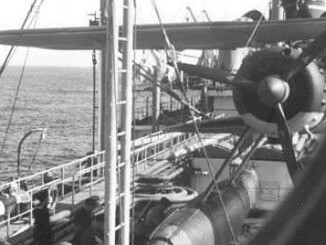 A Hudson flying from Perth sighted Orion two weeks later off southwest Australia, but a force of bombers sent to sink her failed to make contact in poor weather. The Orion’s orders were changed in early September, as she was ordered to cancel her journey to the Indian Ocean and return to the Pacific. 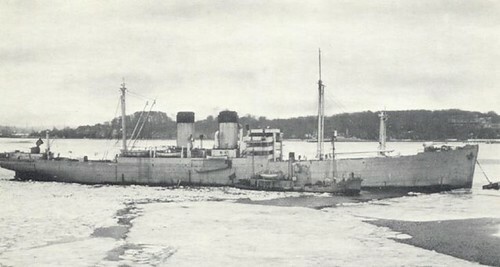 A supply ship, the Weser, was to be despatched from Mexico to meet her in the Marshall Islands but this ship was captured by a Canadian auxiliary cruiser. In her place the supply ship Regensburg was sent out from Japan to the Marshalls with fuel and provisions. Once at their destination, these ships were to await the arrival of another hilfskreuzer. The second German raider to reach the Pacific was the Komet, under Kapitän zur See Robert Eyssen, which arrived via the Bering Straits on the 5th of September 1940. She was known to the British as “Raider-B” and was designated “Schiff 45” by the Germans. Komet had pioneered the northerly approach through the Arctic Ocean because the German high command thought that this might be a viable return route for the dozens of German merchantmen trapped in the Pacific after the start of the war. Supported by Soviet icebreakers, for whose service Germany paid $130,000, she had taken two months to make the trip. Komet carried a similar armament to the Orion, with six 150mm guns, six torpedo tubes, anti-aircraft weapons and mines. She was also equipped with two Arado Ar196A-1 floatplanes, one available on deck and the other crated in the hold. Ordered to sail south to disrupt British shipping around Australia and New Zealand, Komet launched one of her Ar196s on the 2nd of October to expand her search range. The pilots were clearly rusty after spending months cooped up aboard ship, as the seaplane crash landed as it returned to the raider. The Komet arrived at Lamotrek Atoll in the Caroline Islands – a former German possession – where she met the supply ship Kulmerland on the 14th of October. Four days later, the Orion arrived in company with supply ship Regensberg, having captured and scuttled a Norwegian merchantman on the way. The German ships had to share the atoll with a Japanese liner, the Palao Maru, but the Japanese chose not to inspect the visitors too closely despite the fact that the two supply ships were both disguised as the same merchant, the Tokyo Maru, and that the Orion was bearing a disguise that proclaimed her name to be ‘Not Suitable For The Tropics’ – her crew, not understanding kanji, having painted characters from a Japanese pamphlet onto the hull. All four ships, now dubbed the ‘Far East Squadron’, departed Lamotrek on the 20th. 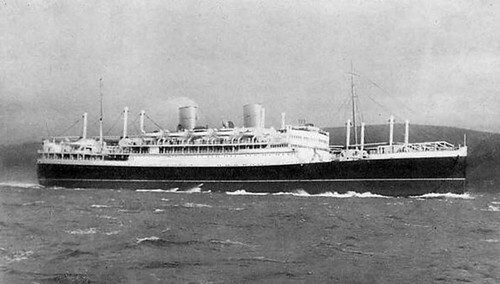 Regensburg was sent back to Japan to restock on supplies, leaving Orion, Komet and Kulmerland to cruise the Panama-New Zealand routes. This they did without much success for two weeks until the Komet and Orion came across the 17,000 ton passenger liner Rangitane, and together managed to box in the faster vessel before she could run. After taking her passengers prisoner and leaving a valuable cargo of foodstuffs and silver bars aboard, the Rangitane was scuttled. The New Zealanders sent out the Empire flying boats Aotearoa and Awarua and the cruiser HMNZS Achilles to locate the raiders, but they found only the wreckage of the Rangitane – despite one of the flying boats being sighted by the Komet. Aware of the relative scarcity of targets in the Eastern Pacific, Kapitan Eyssen of the Komet had been working on a pet plan to attack Nauru. This island was a British possession obtained from Germany after World War I that exported huge quantities of phosphates, which had a large range of both civilian and military uses. Nauru was not defended, and so was a target ripe for the picking by the two raiders. The plan was to use a pincer approach and have the Komet and Orion circle the island from opposite directions, thereby finding and sinking all nearby shipping. Then, a shore party would land and use demolition charges to destroy the loading facilities. 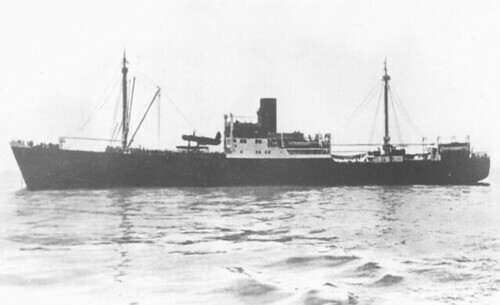 Making their approach to Nauru on the 6th of December, the two raiders came across the freighter Triona bringing supplies to the island and torpedoed her after taking the crew prisoner. The next day Komet made a scouting run on the island, spotting a pair of freighters offshore waiting to load cargo. A third ship, the Norwegian motorship Vinni, was sighted, stopped and scuttled before she could reach Nauru. Reporting back to the Orion with her discoveries the two captains agreed to put the plan into motion during the early hours of the 9th of December. Separating, both raiders came across targets independently – the Orion found and sank the freighters Triadic and Triaster, whilst the Komet boarded and scuttled the freighter Komata. However, high seas prevented the execution of the planned landing operation. Now bursting at the seams with captured prisoners, the raiders decided to put them all ashore at Emirau in the Bismarck Islands, relieving themselves of this load on the 23rd of December. Thereafter the ‘Far East Squadron’ was broken up, due to the continued reliability problems of the Orion. She was ordered to make her way home via the Indian Ocean, whilst the Komet would have another crack at Nauru. Arriving off the island again on the 27th of December, Eyssen signalled that he would confine his bombardment to the loading facilities and oil storage if no SOS was sent. Otherwise, living quarters and administration buildings would also destroyed. Radio silence was maintained, so the bombardment was limited to the port facilities which received a thorough working over. In all, the raiders had succeeded in sinking 26,000 tons of enemy shipping, and damaged Nauru’s docks so badly that shipments were suspended for 10 weeks, and phosphate exports had not recovered to pre-attack levels by the time the Japanese occupied the island in 1942. Orion, meanwhile, was searching for a suitable location to shelter whilst she repaired her engines sufficiently to allow her to sail for home. Her tired Ar196 was used to scout the atolls of the Marshall Islands, but ultimately Orion was forced to head back to Lamotrek where she met and refuelled from the supply ship Ole Jacob. The prisoners released on Emirau had by now reported to the British authorities everything they knew about the ship, so it was clear that Lamotrek would be searched by a warship. Therefore Orion made her way to Maug, in the Mariana Islands, to complete her repairs. It was there on the 1st of February that the supply ship Münsterland arrived with cargo from Japan, including 55,000 bottles of beer and a brand new Nakajima E8N floatplane purchased by the German Naval Attaché to Japan Paul Wennecker. Kapitan Weyher was soon informed that his presence at Maug had been reported, and he was ordered to make his way to the eastern Indian Ocean. Orion therefore headed south, passing east of New Zealand before heading west. The trip was generally an unhappy one, with poor weather and a complete lack of shipping to attack. 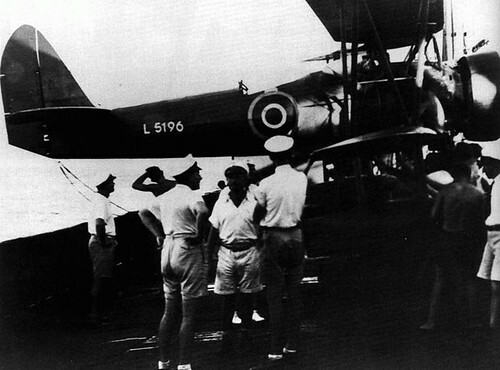 Worse, the new Nakajima – by now painted with British markings – was damaged after banging against the side of the ship whilst being readied for flight. Still, by March 15th the Orion had arrived in the Indian Ocean, and began cruising for trade routes. The now repaired E8N was used to search for the liner Queen Mary, operating as a troopship, but failed to find her. With the eastern Indian Ocean as barren of shipping as the Pacific, the Orion next sailed for Madagascar, hoping to find more luck there. A rendezvous with another supply ship, the Alstertor, provided the raider with mail and a replacement Ar196, although the Nakajima remained in use until it sank after a landing accident on the 26th of May. It was the Arado however, that was airborne on the 17th when it sighted the British cruiser HMS Cornwall which had recently sunk the raider Pinguin – Orion turned away and luckily was not seen by the warship. Thereafter the Orion was ordered to make for the Atlantic and home. Despite suffering a severe engine failure whilst passing south of the Cape of Good Hope, she arrived safely in France in August after sinking one last British ship, the Chaucer, on the way. The Komet was likewise transferred to the Indian Ocean, where she met the former whaler Adjutant, captured by the Pinguin. The little ship was pressed into service as a minelayer, sowing a field off New Zealand in late June 1941, but proved to have serious engine problems and was therefore scuttled after re-joining the Komet. The raider was ordered to head for home by crossing the Pacific and rounding Cape Horn, scouting the various routes to the Panama Canal along the way. Off the Galapagos Islands she found the freighter Australind on August 15th and scuttled her. Two days later she encountered the Dutch motorship Kota Nopan and captured her. Whilst transferring a valuable cargo of rubber, tin and manganese to the raider another ship was sighted, the British freighter Devon, which was also captured. With the loss of three ships within a short space of time likely to provoke a response, the Devon was sunk and the Komet, with Kota Nopan in company, headed for a rendezvous east of New Zealand with the Atlantis. After transferring supplies, Komet departed for home and, after a relatively uneventful journey, reached France on November 1941, her raiding days over. Komet was eventually sunk by British torpedo boats in November 1942 as she attempted to break into the Atlantic for a second raiding cruise.